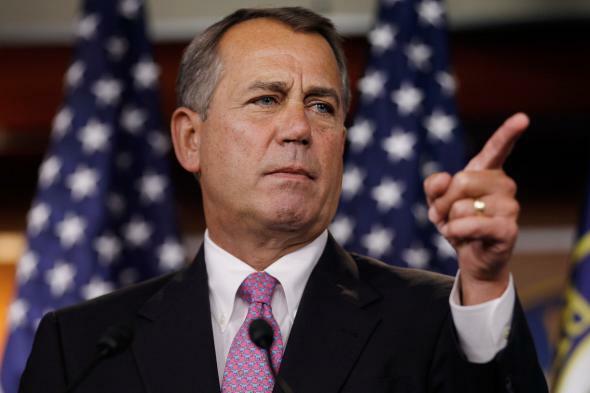 House GOP-Queen of the Hill: John Boehner uses rare procedural tactic to pass defense-heavy budget. House Speaker John Boehner, seen here in April 2012, found a way around a budget stalemate between defense and deficit hawks. Score one for John Boehner and Republican party unity. Score $38 billion for the nation’s war on terror. The House GOP on Wednesday passed Boehner’s budget blueprint of choice, handing the speaker a much-needed legislative victory and keeping alive his party’s dream of sending Obamacare-repealing legislation to the president’s desk, where it will meet a certain veto. The Boehner-backed proposal—which would provide $38 billion more next year for an off-budget war fund than Obama requested—easily beat out a competing Republican proposal that would have provided nearly the same level of military funding, but made roughly half of the increase dependent on finding offsets elsewhere in the budget. The fact that there were two competing GOP budgets on the floor in the first place was noteworthy in itself. That was the result of Boehner’s bid to thread the needle between the ideological demands of his party’s deficit-obsessed Tea Partiers and their defense-obsessed colleagues—a rift that threatened to prove, yet again, that a Republican majority isn’t the same as Republican control in the lower chamber. (See: Homeland Security, Department of.) Unable to appease the competing interests of both defense and deficit hawks, Boehner deployed a little-used procedural tactic—known inside the Beltway as the “Queen of the Hill”—to effectively set up a winner-take-all showdown between the two Republican spending proposals. In the end, the leadership-backed budget resolution garnered 219 votes, more than twice the number garnered by the alternative favored by the GOP’s deficit hawks. Since House Budget Chairman Tom Price unveiled his original blueprint early last week, much of the focus has been on the intra-party GOP feud that threatened to derail the party’s efforts to pass its first budget in nearly a decade. In the grand scheme of things, though, the two House alternatives that emerged were largely the same: both included massive cuts to social programs like Medicaid and food stamps, and both relied on an accounting gimmick to circumvent the spending cap on defense that was imposed four years ago by the sequester. Still, the squabble over the defense-funding details was serious enough to risk derailing the budget process in the unpredictable House. House Republicans, of course, have tried to do just that before. The lower chamber has voted a total of seven times to kill the law in its entirety since the GOP took control of the chamber in 2011, and held roughly 50 other votes during that time to remove or alter specific portions of it. Those efforts, however, were always DOA in the Senate. That won’t be the case this time because budget reconciliation requires only a majority vote and can’t be filibustered. If all goes according to the GOP’s plan this time, the president will be forced for the first time to veto legislation aimed at dismantling his landmark legislative achievement. In the end, then, the GOP’s budget détente that has emerged this week is a demonstration of Republican unity, but one that has been driven by pretty much the only thing the party has always agreed on: their opposition to Obamacare. Still, for one day at least, that’s enough for Boehner to declare victory.